19TH ANNUAL BOWL-A-THON ANOTHER SUCCESS! Home / Blog / 19TH ANNUAL BOWL-A-THON ANOTHER SUCCESS! The Martin & Hillyer annual charity Bowl-a-thon was another big success! 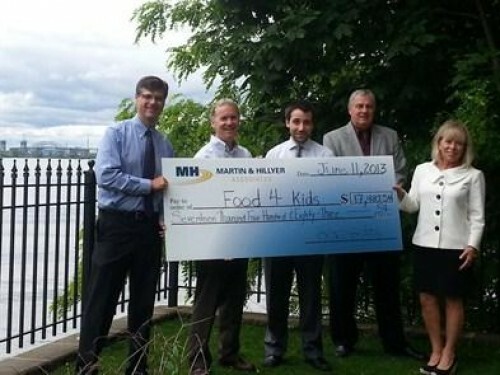 This year Martin & Hillyer teamed up with Food4Kids to raise nearly $17,500 for children who would otherwise go hungry over the weekend. Based out of Hamilton, Food4Kids serves children in Halton, Hamilton, and Niagara regions. Children are identified in the schools they attend and are offered the program, which sees a food pack placed in their backpack each Friday to take home with them for nourishment over the weekend. The funds raised will add 14 schools to the Food4Kids program and feed an additional 180 kids during the next school year. The lawyers and staff at Martin & Hillyer & Food4Kids extend our most sincere gratitude to the many people who contributed towards the success of this year’s event. To find out more about Food4Kids please visit http://www.food4kids.ca/. From left, lawyers Stephen Abraham, David Hayward, Kennedy Nolan and Bruce Hillyer present the cheque to Lena Bassford from Food4Kids.